3)Age Limit:- 45 as on 01/11/2017. (Age relaxation for reserved category candidates as per rules). What is the Process for Selection this AIESL job? ITI with NCTVT in Fitter trade with Minimum one year experience in their trade and/or in aircraft structural repair (aircraft maintenance). 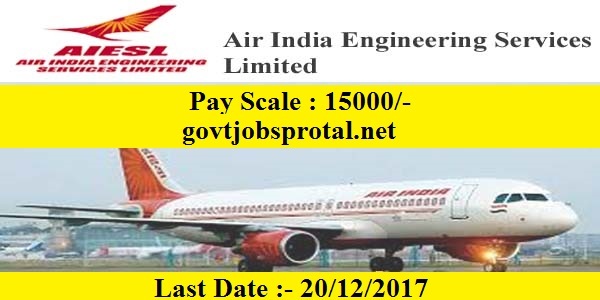 (Experience in Airbus/Boeing fleet be preferred). 5)Nationality Criteria: Only Indian Citizen can apply this ITI Pass job. The Tradesman/Bench Fitter will be under training for a period of one year and would be paid 15,000/- (uder revision) as stipend during the period of training. On successful completion of training the candidates would be placed as TRADESMAN/BENCH FITTER And would be paid an all-inclusive emoluments of 17,680/- per month. 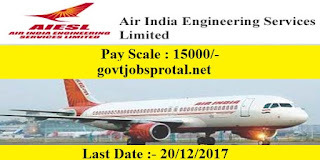 For details please log on the on the career page on our website www.airIndia.in. (You will get more information in employment News paper dated on 2/12/.2017 Page no.(25).) visit the official website for more information.